An orthodontist is a general dentist that has had three more years of full-time training in orthodontics resulting in a nationally accepted specialty certificate. The orthodontist then limits his practice to straightening teeth and dentofacial orthopedics. We do not bill insurance directly however, in most cases, we can help you in verification of coverage. To do that please bring your insurance information with you at your initial appointment. After you start treatment we provide you with payments verification and receipts for all the payments you make towards your treatment so you can claim reimbursements from your insurance depending on the type of coverage you have. However, we ask patients to understand that if coverage ceases or changes, the patient is still responsible for the agreed upon fee. Do you charge interest on your payment plans? Phase 1 treatment is delivered early and before all permanent teeth have erupted. The purpose of this early care is to start correcting harmful malocclusions that may be more difficult or impossible to correct later. 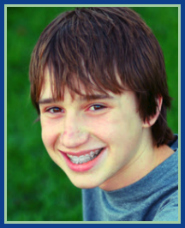 Phase 1 treatment does not eliminate the need for conventional orthodontics done during adolescence. Examples of phase 1 treatment include correcting individual tooth or jaw crossbites and overbites where function, esthetic or psychological concerns are identified. Phase 2 treatment is conventional orthodontic treatment. It may start while the last baby teeth are falling out and continue until the 12 year molars have been evaluated or straightened. This treatment usually lasts between 1 and 3 years. Experience and research shows that early treatment achieves meaningful goals but the quality of the result is determined at the end of care. For this reason, we do not encourage early treatment unless significant benefits can be achieved. Complete treatment can usually be accomplished in 1 to 3 years of active tooth movement. Sometimes, this active movement is divided into two or more periods of time with a rest of 6 to 18 months in between. (See phase 1 and 2 treatment above). How about retainers glued to the back of teeth?